The 10 Bears is awarded for mastering the sport of ultrarunning. It is a clock and a standing Grizzly Bear mounted on a large slab of native Montana juniper or cedar. It is earned by a runner who completes 10 Le Grizz events as a registered entrant. The runs do not need to be completed consecutively, and there is no time limit, but there is a penalty for not finishing: No credit for a completion. 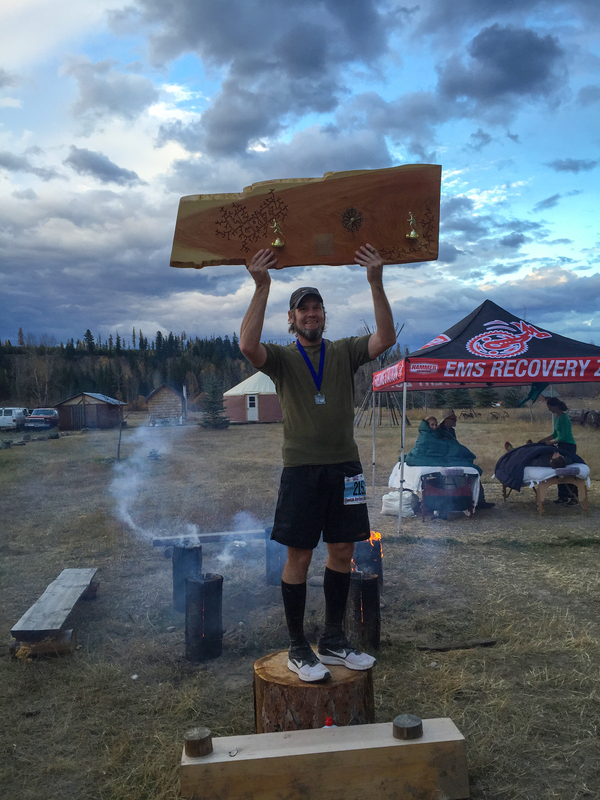 This award is unique in the sport of ultra running, as it takes at least 10 years to earn. Learning to run ultras is an undertaking that takes years, has nothing to do with accidentally finishing one’s first ultra attempt, and is different for everyone. The 10 Bears Award is a measure of the commitment, perseverance, injury management and mental tenacity one must develop to persist in the sport. An occasional DNF or missed year is simply part of a runner’s development. This award, unlike recognition for winning or setting a record time, emphasizes! finishing. It places a premium on the patience needed to incorporate necessary recovery periods (with their attendant physical deterioration) into one’s lifestyle, to stop and smell the roses rather than just stop and smell. It provides incentive to learn pacing, or to tough it out when a fast time is not going to happen. And it makes one hell of a belt buckle. The Chief 10 Bears Award enhances membership in the 10 Bears Den by recognizing lifetime achievement. It is conferred on a runner with 20 completions. It is derived from the legacy of Paruasemena, a Comanche Chief whose oration at the Medicine Lodge Peace Treaty in 1867 is still regarded as the finest ever delivered by a native American. After completing one’s 20th run, a candidate may participate in a First People’s Confirmation, as elements found in Native American culture furnish the most appropriate perspectives available for honoring the accomplishment.